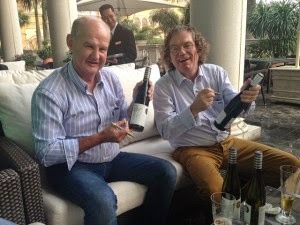 This posting focuses on one particular event, a spectacular tasting, led by Stuart Pigott: Rieslings from the New World – More Traditional than Rieslings from the Old World? Stuart Pigott: Jeffrey Grosset, owner and founder, has always been an innovator, challenging tradition and questioning accepted practices. The winery was founded in 1981. The vineyard area totals 21 hectares. Production is 11000 cases. Riesling accounts for 70% of the production. The Claire Valley, north of Adelaide, where Grosset is located, is one of Australia's oldest wine regions, best known for Riesling wines. It has a climate of daily extremes. Stuart Pigott: Both are extremely bright wines. Both wines are bone dry. Both wines have strikingly different personalities. Stuart Pigott: Henscke is a sixth generation family estate established in 1868 in the Barossa’s Eden Valley. The vineyard area totals 100 hectares. Production is 40000 cases. Riesling accounts for 10% of the production, Shiraz for 40%. Stephen and Prue Henschke believe in careful traditional winemaking and use organic and biodynamic practices. Lots of apple notes, high acidity, long finish. Stuart Pigott: Striking acidity, with aromatic layers. One of my Australian favorites. All 4 of them, you could leave for another 20 years in the cellar. Stuart Pigott: Frankland Estate is a family owned and operated wine producer located in the isolated Frankland river region some 380 kilometers south-east of Perth in Western Australia. It was founded in 1988. The vineyard area totals 30 hectares. Annual production is 20000 cases. Riesling accounts for 30% of the production. 11% alcohol – so much for New World wines being high in alcohol. Stuart Pigott: Back to the Claire Valley. Jim Barry was founded in 1959. The vineyard area totals 243 hectares. Annual production is 80000 cases. Riesling accounts for 30% of the production, Shiraz for 40%. I cannot imagine a more prototypical Australian Riesling than this one. Has the lime aroma, which is so typical for Australian Riesling. The wine has lost first flush of freshness. Stuart Pigott: Nobody is taking East Europe seriously, when it comes to Riesling. But a lot is happening there. I included 2 wines from “behind the Iron Curtain” that should give you an idea what is happening there, in Ukraine, Moldova, Hungary, Czech Republic and other countries. Stuart Pigott: From the Slovakian part of the Danube Valley. An Egon Mueller (Mosel) project. Founded in 2001, 6 hectares, 2000 cases. Stuart Pigott: A wine from the Sachsen area in the former GDR. A seriously concentrated and elegant wine. It has some noticeable sweetness, but this is where the fermentation stopped. Weingut Klaus Zimmerling was founded in 1992, 4 hectares, 1300 cases, 40% Riesling. Stuart Pigott: A wonderful combination of wines, showing very well how these wines can age. Mosel has played a role in these wines, but they have their own personality. Demeter-certified viticulture and very simple “hands off” winemaking. Felton Road was founded in 1991. Annual production is 12000 cases. Riesling accounts for 10% and Pinot Noir for 70%. Stuart Pigott: These wines caused quite a storm at a blind tasting in which I participated. People thought that this was not possible in New Zealand. You have to be daring. Obviously, such wines can not only be made in the Mosel Valley. Framingham was founded in 1994; it is owned by Sogrape Vinhos. Annual production is 26000 cases. Riesling accounts for 8% and Sauvignon Blanc for 75%. Stuart Pigott: These and the other wines show that New World wines can be subtle, can be intense, can be mind-blowing.